When she was three, Jessica was placed in a facility for medically fragile children. Her complex health care needs were more than her single mother could manage with two small children and practically no in-home support. Seven years later, EveryChild started working with children living in that facility. Kimberly, EveryChild’s Family Resource Coordinator, already knew Jessica and her mom. At one time, Kimberly’s child lived in the same facility as Jessica. Knowing that Kimberly really understood what it takes to support a child with complex needs at home, Jessica’s mother was open to learning from her about other options. A lot had happened since she placed Jessica. She had remarried, she had gone back to school to study pediatric nursing, and Jessica’s brother was now older. After a couple of months of careful thought and prayer, she knew the time was right for Jessica to come home. 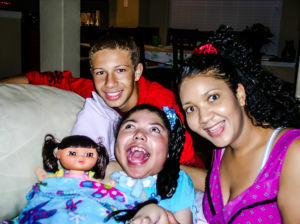 Kimberly pulled together the supports that would make Jessica’s return home successful: nursing care, wheelchair ramps, a shower chair, a ventilator, medical equipment and supplies, and respite from the Medically Dependent Children’s Program. From Jacob’s first violin performance, the family has faced the future together, under one roof.